The charity sector could offer “great opportunities” to test new blockchain technology, according to the Charities Aid Foundation. The UK’s chief scientific advisor today urged the government to adopt ‘distributed ledger technology’ of the kind currently used to underpin the digital cryptocurrency Bitcoin, as a more secure way of managing data in in various public services. Research carried out by CAF, which promotes charitable giving and provides financial services and social finance to not-for-profit organisations, shows that charities could help to unlock the huge potential of these digital ledgers. Rhodri Davies, Programme Leader of Giving Thought, CAF’s think tank said: “It is great that the government is looking at the ways in which blockchain technology could transform public services, but it would be a real missed opportunity if they did not include charities in their thinking. “CAF has outlined in a series of reports the ways in which we think the blockchain could revolutionise philanthropy and charitable giving, and the government has a real opportunity to test these ideas in any future pilot programmes. “From the point of view of charities, the support of government could provide a way to explore some of the huge potential of distributed ledgers. From the government’s point of view, the charity sector would offer great opportunities to test some of the applications of this technology to social issues without all the complexities of the public sector. Radical transparency: The public nature of the blockchain has significant implications for openness and transparency in any system based on it. This may open the financial dealings of charities and philanthropists up to unprecedented levels of scrutiny. This may offer benefits in terms of increasing levels of trust, but it will also present real challenges. Low or Zero Transaction Costs: By removing the need for third parties to manage transactions and record-keeping, the blockchain can massively reduce or even remove transaction costs, thus saving large amounts of money and enhancing trust and confidence amongst donors and supporters. New types of assets: Blockchain technology will open up the possibility of transactions in all sorts of assets where this was previously impossible or impractical. This includes donations. Whilst charities may struggle with the challenges of early adoption, there are potentially huge advantages to finding ways to harness this new technology and accept donations of digital assets. Sharing Replaces Ownership: The use of blockchain technology could lead to an exponential growth in the “sharing economy” by making the attribution and transfer of ownership fast, cheap and easy. This may have an impact on traditional donations, particularly those of non-cash assets. Philanthropic Smart Contracts: The development of smart contracts holds huge potential for philanthropy. At the most basic level, it would be possible to include clauses in smart contracts which stipulate that donations are made if certain trigger conditions are met. For example, a company might set up smart contracts which specify that a percentage of profits above a certain threshold go to charity, or a smart electricity meter might be configured so that a percentage of any financial savings made through energy saving measures are given to charity. There is an obvious opportunity for charities to promote this as a way of giving, and to partner with companies that could enable such contracts. Giving in the digital age: what can bitcoins tell us about future-proofing charity? 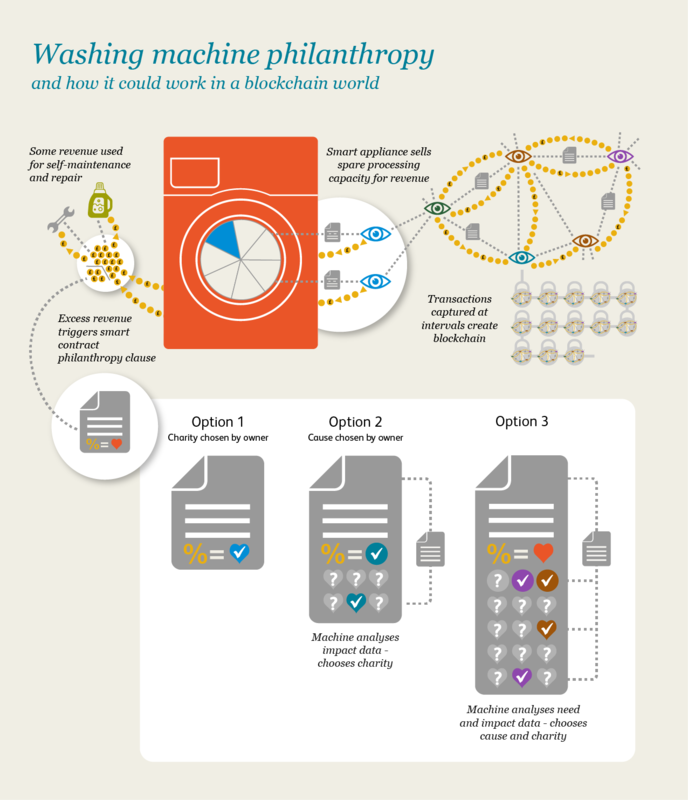 View the infographic 'Washing machine philanthropy and how it could work in a blockchain world'.